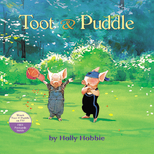 Toot and Puddle: How Does Your Garden Grow? Toot and Puddle: Get With the Beat! Toot and Puddle: Take a Leap! Holly Hobbie has worked as an artist for more than thirty years. She is the creator of many books, including the New York Times bestselling picture book series, Toot & Puddle, an illustrated memoir entitled The Art of Holly Hobbie, and most recently, Fanny. Holly lives with her husband in Conway, Massachusetts.